The use of video projectors has been seen mostly in commercial and business entertainment in the past. However, this is not the case today and video projectors have become more affordable and available item even for the people with average lifestyle and income. CRT, DLP and LCD are the three main types of video projects. LCOS, D-ILA and SXRD are other variants that are used in LCD video projection technology. Here’s what you need to look for before you go to have a video projector for your personal use. 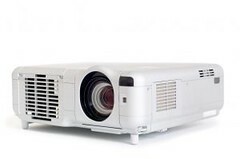 Portability factor in video projectors is really important. It doesn’t allow you to move with your own device but also simplifies the setup and installation process. It also allows you to try different distances and screen sizes. You can’t get a clear image without sufficient brightness. Therefore, brightness is also an important factor to consider before you buy a video projector. Your image will look like a soft, muddy image without proper brightness, even in a dark room. You should consider minimum 1,000 ANSI Lumens rating in your projector to get sufficient brightness. Although you may get clear image with a great Lumens rating but the contrast ratio is equally important, because low rating may give you washed out image. It’s said that contrast ratio actually complements brightness. Usually, minimum 2,000:1 or higher is considered as an excellent contrast ratio for video projectors. Pixel Density is another important point to focus when purchasing video projector. Usually, there’s a fixed number of pixel setting in LCD or DLP projectors. You should consider maximum native pixel counts especially if HDTV is your viewing priority. 1024 x 768 is recommended pixel count for DVD. However, 1280 x 720 pixel count is recommended for HDTV input signal. You should consider natural color depth and flesh tones in your device because color reproduction is an equally important point in video projectors. Check closely the darkest and brightest areas of the image. Don’t forget to check whether projector has your desired input, such as component inputs for DVI and DVD, S-video for analog sources or HDMI inputs for HD sources.